Despite making a weekly meal plan, we eat at least one dinner a week out of the freezer and often ditch another well-planned meal for something quick and easy. 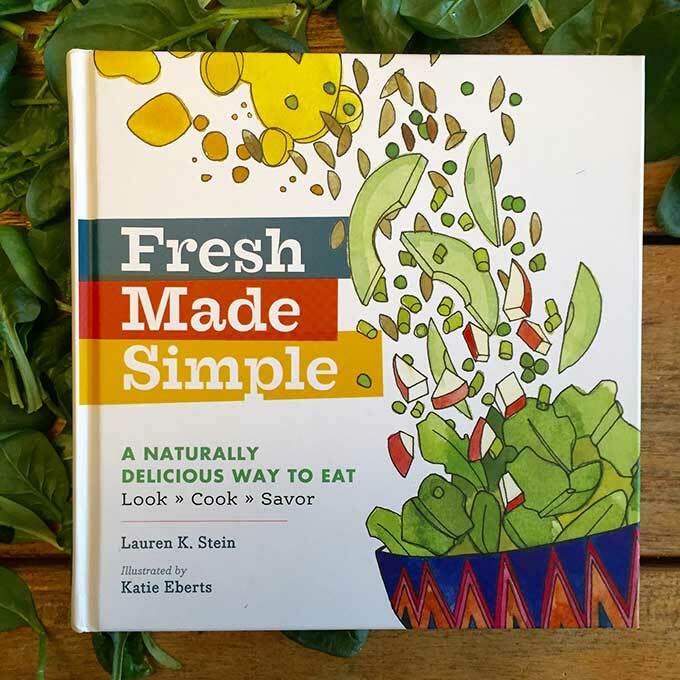 Lauren K. Stine’s recipes in Fresh Made Simple are not only great for fast, fresh, mid-week eats, but also for quick, clean snacks and spreads to whip up when unexpected guests come knocking. This book is so inviting and easy to use. All it takes is a quick look at Stine’s simple list of staples for stocking a “fresh kitchen” and a scan of one of Katie Eberts’ illustrated spreads before heading to the grocery store or farmer’s market. Much of the actual meal-making takes 10 minutes or less of prep. Unlike a traditional cookbook, Fresh Made Simple's recipes don’t include a list of ingredients or even precise measurements. All of the ingredients and most of the kitchen action is illustrated rather than written out. Amounts appear as written-in labels. In the Ginger Lemon Honey Butter recipe, for example, lines connect a bright yellow lemon to the word “zest” and a tipped bottle of honey to “just a squeeze.” Eberts draws most of the meals in-the-making: salad components cascading down into a bowl, pesto ingredients sprinkled, squeezed, and grated into a food processor. The whole thing is designed perfectly to convince the crunched-for-time cook that a fresh meal really can be simple. As an added bonus, my preschooler was thrilled to “read” her first recipe (a fruit and veggie smoothie) and tell me how to make it.